This bustling California city can be a hassle when you need free parking unless you know exactly where to look. Familiarity with Berkeley parking rules so you’ll know that free spot is actually free. Type any address and use the time filters on the map below to find a free parking spot in Berkeley city. 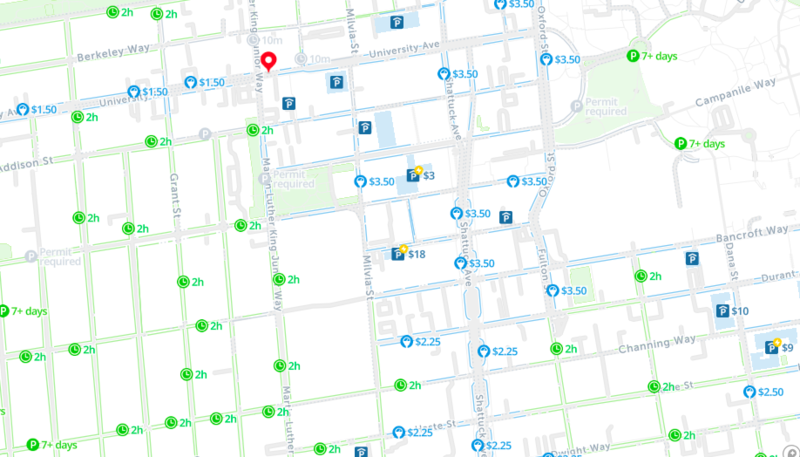 The map is free, easy to use, and will save you a serious headache when you’re on the hunt for free parking. Free parking on green curbs: If you see a green curb, you can park there for a few minutes to unload your car or pick up passengers. Great for moments when you’re only stopping by and need less than 30 minutes. Free overnight parking on weekends: Most zones are free to park after 5pm Friday through Sunday and you’re able to leave your car all weekend. Free overnight parking in residential areas: Most residential areas are free to park overnight. They are also free to park during the day but watch out for time limits, you just need a residential permit to avoid them. Check out our parking guide to learn more about that. *If the parking holiday falls on a Sunday, the following Monday is free parking.